If you're one of the millions currently playing WoW, now's your chance to proudly display your faction allegiance (Alliance or filthy Horde) in a giant photo mosaic put together to celebrate the franchise's fifteenth anniversary. In November, mega-MMOG World of Warcraft turned five years old, but that wasn't the only anniversary that California-based PC giant Blizzard was celebrating last month: It was the fifteenth anniversary of the Warcraft series as a whole. To celebrate, Blizzard's head honchos have been talking about the evolution of the franchise and even set up an anniversary celebration site to commemorate the occasion. 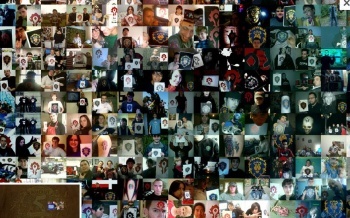 One of the cooler promotions up on the site is the Battle Cry mosaic, a project that asks World of Warcraft fans to take pictures holding their banner of choice and email them to the WoW team. The pictures will then be stitched together in a giant photo mosaic celebrating the thousands of thousands of people who all enjoy life in Azeroth - and the more photos sent in, the more concept art will be "unlocked" on the site. It's a really nifty little idea, and a good way for everyone to proudly proclaim your allegiance - whether a member of the noble Alliance or one of those dirty Horde - so if you've got an interest in being part of the mosaic, pick up your camera and get a-shootin'!